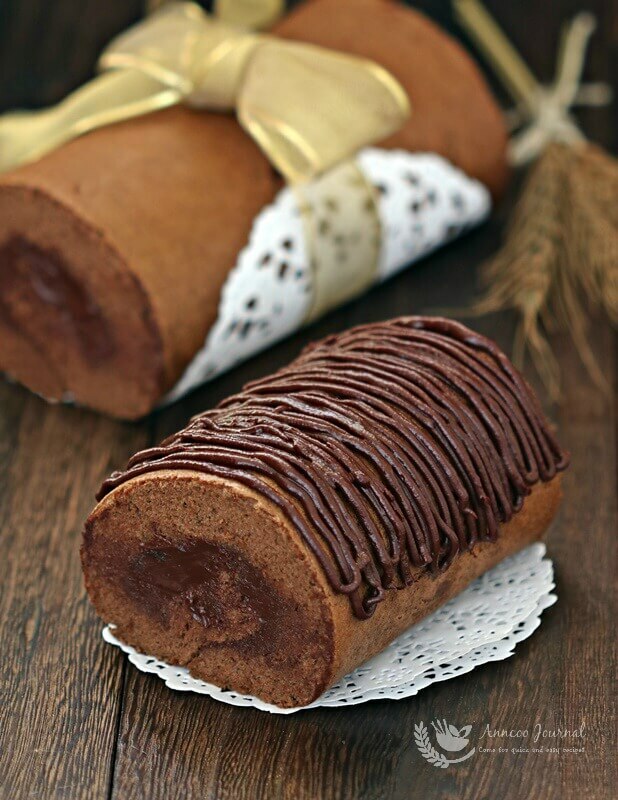 This chocolate Swiss Roll is soft and moist and full of chocolate flavour. This is a basic light chiffon cake recipe and is not complicated to make at all. In fact I spent less than an hour to complete the cake minus the chilling time. Kids will be delighted to enjoy this Swiss Roll cake with the extra chocolate cream frosting and it will definitely be gone in no time. Just a small note, I used a 10×11-inch tray pan, to make the cake longer and thinner, so the kids can have more slices to share. However, you can use a 10 x 10 inch square pan for a thicker cake. Combine egg yolks and sugar in another bowl, mix well. Add milk and vanilla extract, mix well followed by corn oil and blend well. Sift in flour mixture the second time into egg mixture and stir well. Make meringue - Beat egg whites until foamy. Add sugar mixture in 3 separate rounds beat until egg whites are glossy, with stiff peaks. Fold ⅓ of egg whites into the yolk mixture with a rubber spatula. Then pour in the remaining egg whites, gently fold before the next until just combined. Pour chocolate batter into prepared tray and spread out with a rubber spatula. Gently tap the tray to release air bubbles. Bake in preheated oven at 180 deg C for about 15 minutes. Remove cake from pan, remove the parchment paper and leave to cool. Chocolate cream - Place chopped chocolate pieces and butter into a bowl, set aside. Bring whipping cream to a boil at medium heat, then pour over the chocolate pieces. Stir chocolate till smooth. Chill the chocolate cream in fridge for about 30 seconds to one minute to thicken a little. Place chocolate sponge cake (can use either side) on a plastic sheet or parchment paper (with a dry cloth placing beneath the plastic sheet to prevent slip while rolling the cake). Spread a layer of chocolate on top of the cake. 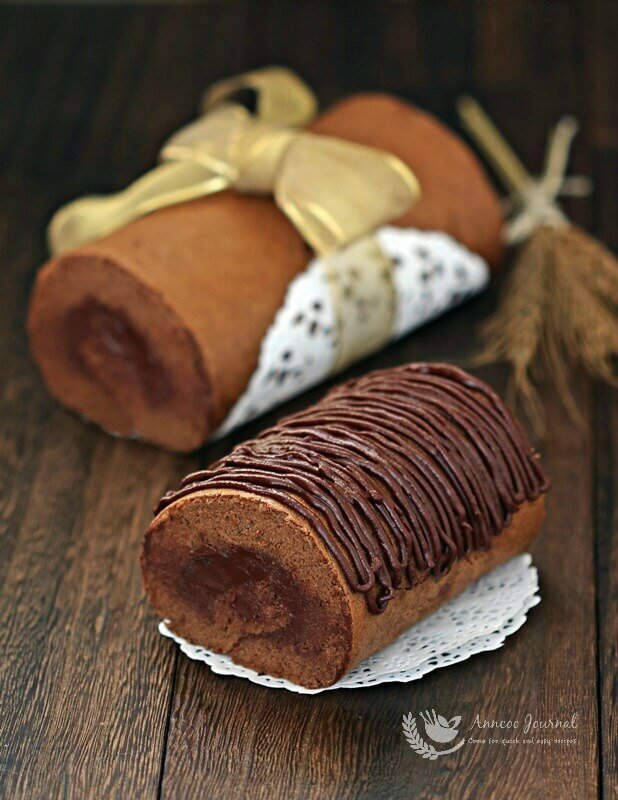 Gently roll up the sponge cake to make a Swiss roll and chill it to set for about an hour. Fill the remaining chocolate cream into a piping bag with nozzle tip #3 and pipe lines on cake. Place the roll cake back to the fridge and chill for 1 - 2 hours before serving. 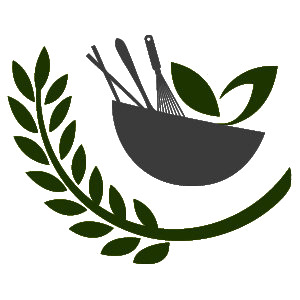 Can replace rice flour with other flour like cake flour or all purpose flour? Hi Yen, Yes, you can use 70g of cake flour or all purpose flour and omit the rice flour. Ann, I envy how you can neatly roll up all your rolls in you blog. This one is so pretty! Ann, I will try this recipe! 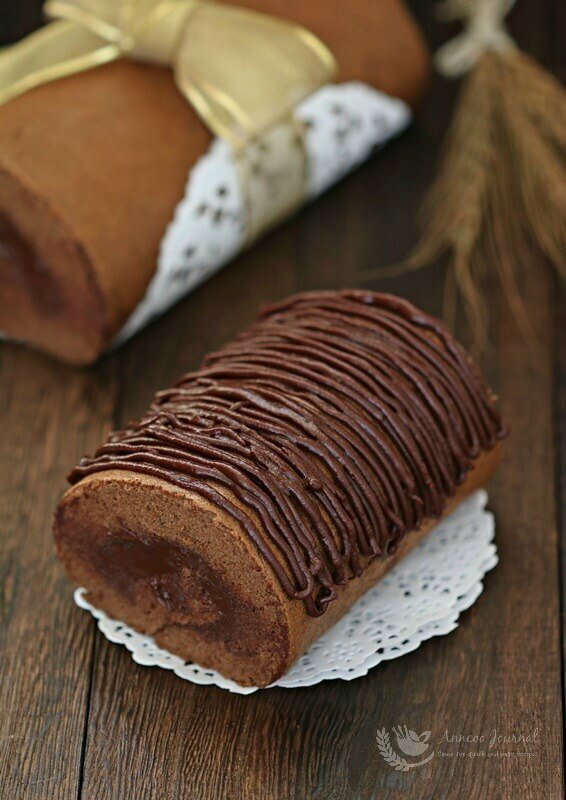 The cake roll looks perfectly tender and so chocolatey!